My kids constantly as for drinks in the summer holidays, and buying cartons when you've forgotten their sports bottles all adds up over 6 weeks. Its so much easier when they have a buggy and buggy bag as you check this constantly before you go out, but now it's just me and my handbag, I often forget. 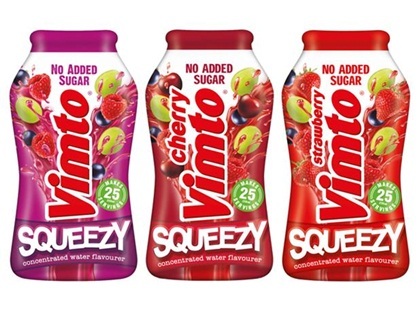 Vimto Squeezy's are small,in fact tiny, bottles of highly concentrated juice. They are well packaged, colourful little pots and take up no room whatsoever in my handbag. They can be added to any water you like. The first thing I was surprised by was how far one little bottle went. They are 50ml size, and offer 25 servings- I was dubious at first but one tiny bottle lasted the entire time we were at Camp Bestival- and it was very hot so the kids constantly wanted a refreshing drink. The great part of these are that they have no added sugar- us parent's have once again been harangued for giving children something we all drank when it was positively tooth rotting back in the 80s, so the guilt factor of what we previously thought was a great source of refreshment over fizzy drinks can be banished. They come in three flavours (Littlest liked to mix his up), so they please everyone. I tried the Cherry flavour, expecting it to be either very sweet or very weak. However, I found it pleasant and thirst quenching, and considering we had filled a sports bottle with water from a tap then squeezed some of this into it, it was ridiculously cheap too. Even better they are low in calories- hurrah! They are so simple to use that even Littlest could manage it. At around £2.25, this may seem pricey, but when you consider the saving on buying standard named brand cartons whilst out that leak and are easily forgotten, over the Vimto Squeezy which can be dropped in your bag and forgotten about until you need it again, I think it works out fine. At 9p per squeeze (worked out at cost price divided by 25 average squeeze amount). We certainly will have these in my bag for future use whilst outdoors.